The MSO invites you and your students to take a hilarious leap into the world of the orchestra with musical comedy trio, Tripod. Experience Scod, Yon and Gatesy performing songs and making funnies (sometimes at the same time), joined live onstage, of course, by Associate Conductor, Benjamin Northey and one very charismatic orchestra. It’s finally time to answer a question that has long plagued the global arts community: Who knows more about music? Tripod or Leonard Bernstein? 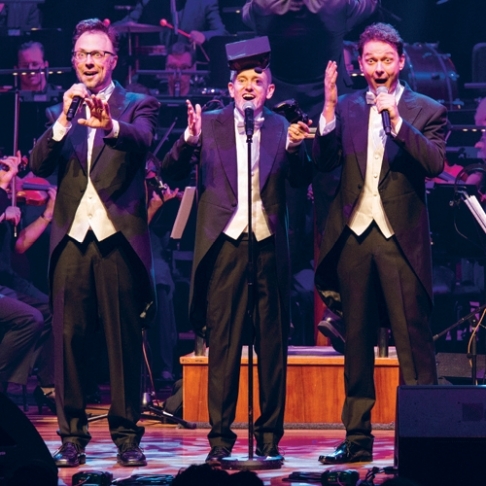 Comedic legends Tripod return to the Hamer Hall stage with the Melbourne Symphony Orchestra and conductor Benjamin Northey to take on the big man himself, in three spectacular tributes which will have you (and possibly 80 musicians) in stitches! Come and be part of the silliest bit of the 100th anniversary celebrations of the iconic composer, educator and musical ambassador. A suite of curriculum-linked pre-concert resources will be issued to all school ticket holders prior to your excursion, extending your school’s experience well beyond the concert itself.